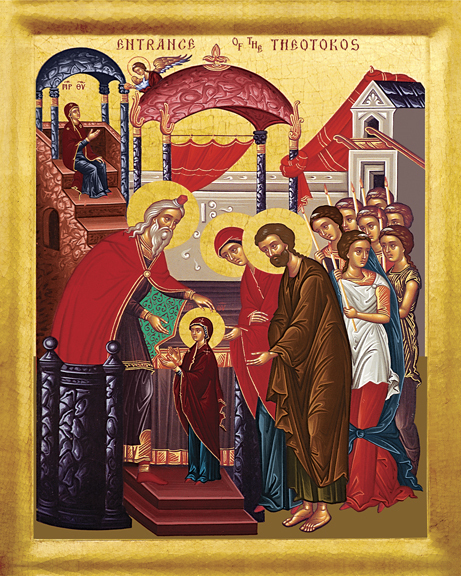 The feast of the Entrance of Mary in the Temple is celebrated by the Orthodox Church on November 21st. According to tradition, Mary was brought to the Temple in Jerusalem and she lived inside the holy of holies. It almost certainly is not a historical event in the life of Mary: Only one person, the high priest, was allowed to enter the holy of holies, and even he entered only once a year, on the Day of Atonement. It is simply unimaginable that a young girl would be allowed to enter the holy of holies and live there for years! Yet, the church found it meaningful to incorporate this apocryphal story into our annual liturgical cycle. I like to call this an example of the church’s imagination. Categories: Sermons | Tags: Entrance of Mary | Permalink.